The internet companies have taken the world by storm over the last 10 years, but diversification will decide who the winners are in 10 years’ time. One of the major announcements last week was Facebook’s blockbuster quarter, which saw the social media giant grow advertising revenues 56% year-on-year, collecting total revenue of $7 billion for the period. This is a massive amount of cash, and the success of Facebook has been defined by its ability to create advertising solutions which link brands and consumers better than any other platform in the industry. But are these glory days coming to an end? Now we’re not talking about the end of Facebook, but rather the weakening of internet advertising revenues. This is not a new idea, but the idea of Facebook being impacted was unthinkable previously. The other guys maybe, but Facebook was way out of the question. “We continue to expect that ad load will play a less significant factor driving revenue growth after mid-2017,” said David Wehner, Facebook’s CFO during its earnings call last week. “Over the past few years, we have averaged about 50% revenue growth in advertising. Online and mobile advertising is beginning to creep towards saturation point. There simply aren’t that many advertisers or advertising dollars to maintain these growth figures. Facebook will continue to bring in billions through advertising, but to meet the growth ambitions of investors, the company will need to diversify its profit lines. What ‘meaningfully’ translates from corporate speak to is anyone’s guess, but the Facebook team are not anticipating the 50-60% growth in advertising revenues for too much longer. Although this part of the announcement seemed to slip under the radar for most, it is likely to be one of the factors contributing to a fall in share price for Facebook. 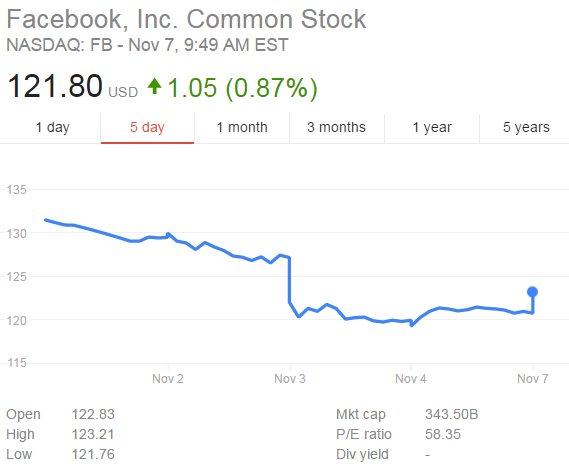 At the beginning of last week (Oct 31), Facebook was trading at $132 and by Friday (Nov 4) this was down to $120, a decrease of roughly 10%. This is far from disastrous, however considering it was the same week the team announced 56% growth in revenues it may seem a little odd. Long-term advertising revenues are unlikely to be entirely to blame here as the S&P 500 fell for an eighth straight session last Thursday; Facebook isn’t the only share price to been moving the wrong direction. Analysts have pinned the decline in the S&P 500 on a highly publicized presidential election which may have investors nervous, and also discussions surrounding raising interest rates in December. That said, the message from Wehner was clear in the call; advertising will be a cash cow, profits are going to have to come from somewhere else. The team are taking on Amazon in the eCommerce arena, Slack in the collaboration market and HTC in the growing virtual reality space. And the Facebook team are not alone here. 12 months ago, Google restructured its business to create Alphabet, the company’s new parent company. The move allowed the Google exec team more freedom to invest in alternative revenue streams and test out new markets. The success of these ventures has not been directly felt to date, though it has had a play in physical broadband infrastructure, enterprise & public cloud, autonomous vehicles and MVNO segments, as well as numerous others, to varying success. Snap is another which has chosen to diversify having a little flutter in the video hardware market. The launch of Spectacles brings Snap into direct competition with GoPro and does demonstrate a stagnation in the internet/mobile advertising revenues; if Snap wants to grow quickly it will need to find new markets. Twitter is an interesting one however, as there would appear to be very little differentiation. The platform is essentially the same as it was when it launched in 2006 and there have been very few big moves to chase after new revenues. Most wouldn’t mind if the team were nailing it, however the success of Twitter has been on a different trajectory to Facebook. It may not have surprised many in the industry the team were unable to find a match throughout all the acquisition chat. With the other major player looking to use brand credibility to break into new markets, Twitter execs are still trying to crack the online advertising equation for its platform. Might be time to accept what it has and investigate how it can supplement elsewhere. Twitter has a strong brand which could provide much needed weight when entering into new areas, but if it doesn’t hurry up it will be left behind… again. Online and mobile advertising are going to continue to fund the industry, but to meet the growth demands of investors, the internet giants are going to have to look elsewhere. The ability to capitalize on online and mobile advertising platforms defined the winners of the last 10 years, and the next decade will be decided by differentiation. Given the scale and outreach the internet offers, the industry might be dominated by a completely new player in 10 years. After all, Facebook only made around $48 million in 2006.